Regan Ramirez jumps into the arms of Addison Moyer to celebrate Moyer’s go-ahead goal that led Archbold to a 1-0 win over Liberty-Benton in a Division III girls soccer regional final Saturday. The Bluestreaks will next take on Kirtland in the state semifinal Tuesday in Sandusky. Kate Short of Archbold sends a ball upfield Saturday versus Liberty-Benton. Lily Krieger of Archbold receives a ball in open space. 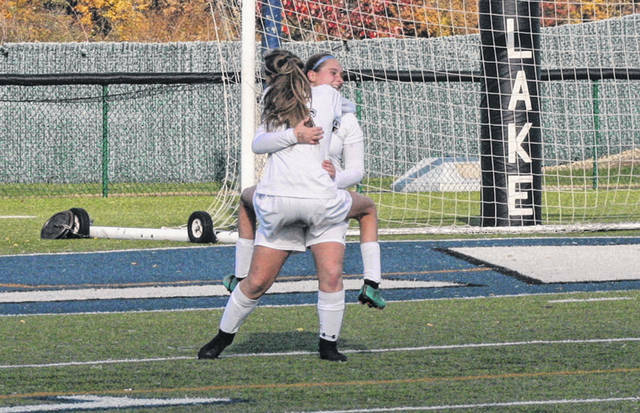 MILLBURY – In the ultimate case of redemption, Archbold scored with just under 23 minutes remaining and held on for a 1-0 victory against Liberty-Benton in a Division III girls soccer regional final Saturday afternoon at Lake. The win avenged last year’s loss to the Bluestreaks which sent the Eagles to the state semifinal. ‘The one that went in’ can be credited to the work of a sophomore and a freshman. 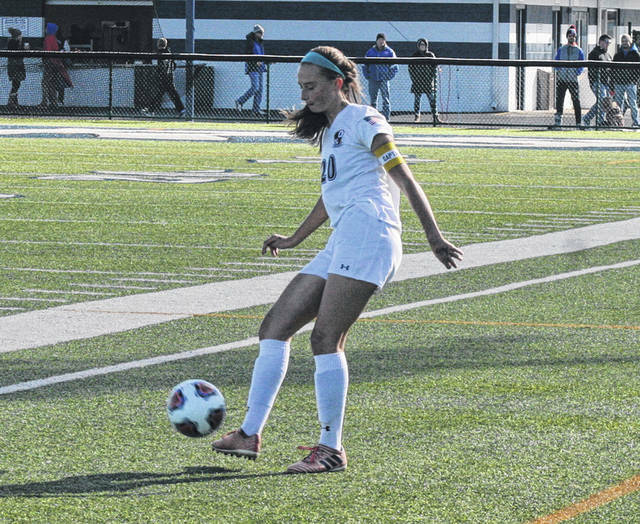 Bluestreak sophomore Regan Ramirez had a 1-on-1 opportunity and when her shot was knocked away and the Eagle defense attempted to clear, freshman Addison Moyer lofted it back toward the net for the goal. As expected, the Eagles went after it hard in the last 20 plus minutes. At the 17:39 mark, Maya Rickle fired one on target from 10 yards away that Archbold keeper Reagan Kohler was able to scoop up. Rickle then had a free kick from 30 yards out just over three minutes later, however, Alexis Richenbacher was unsuccessful at getting her head to the ball and Kohler eventually corralled it. “Reagan is a freshman, and she plays like a senior in college,” said Kidder. “She’s so calm and composed all the time. You would never look at her and think she’s nervous, scared, or apprehensive about a game. Richards had a decent look late in the first half but was turned away. Liberty-Benton’s Maddie Parmelee centered it to Richards, only for her to put it into the arms of a waiting Kohler. The Streaks now advance to the state semifinal for the second time in program history. In 2011, they fell to Shaker Heights Laurel 1-0 in the semifinal. 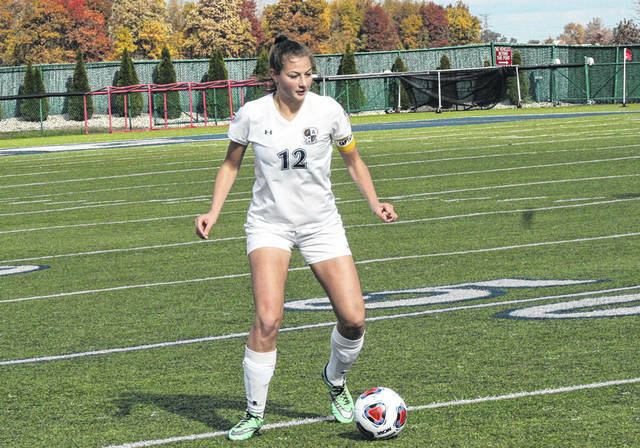 Archbold (14-1-4) takes on Kirtland (17-2-0) Tuesday at 6 p.m. at Cedar Point Stadium on the campus of Sandusky High School, looking for a berth in the state title game. In the nightcap, the Archbold boys also play Kirtland in a state semifinal contest.